Khemed may be cut off from his family's fortune, but this human fighter intends to amass his own. A mercenary leader devoted to Bhaelros, Khemed and his Blades are efficient fighters you should keep your eyes on -- best accomplished by never showing him your back. Khemed: Male human Ftr8; CR 8; Medium-Size Humanoid (5 ft. 6 in. tall); HD 8d10+24; hp 68; Init +9; Spd 30 ft.; AC 19 (touch 13, flat-footed 16); Atk +14/+9 melee (2d4+9, +1 spiked chain), +12 ranged (1d8/19-20, light crossbow with masterwork bolt); AL NE; SV Fort +9, Ref +5, Will +2; Str 18, Dex 16, Con 16, Int 13, Wis 10, Cha 14. Skills and Feats: Climb +8, Diplomacy +4, Handle Animal +7, Intimidate +8, Jump +8, Listen +2, Ride (horse) +6, Spot +4, Tumble +4, Use Rope +5; Combat Reflexes, Exotic Weapon Proficiency (spiked chain), Improved Disarm, Improved Initiative, Power Attack, Quick Draw, Thug, Weapon Focus (spiked chain), Weapon Specialization (spiked chain). Possessions: +2 studded leather, +1 amulet of natural armor, +1 spiked chain, 3 potions of cure light wounds, potion of cat's grace, potion of cure moderate wounds, potion of bull's strength, masterwork light crossbow, 10 masterwork bolts, 70 gp. Born in Calimshan of a fairly wealthy family, Khemed offended his father and was cast out of his home. He continued to practice in the arts of war and worked as a mercenary, turning to banditry when times were rough. 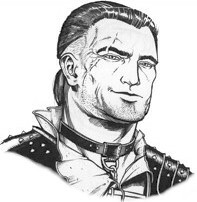 He has gathered a group of younger mercenaries about himself (10 male humans Ftr1) and hires his team out as "the Blades of Bhaelros." Khemed is a faithful worshipper of Bhaelros (the name for Talos in Calimshan) and has contacts with clerics of Talos in most major cities across western and southern Faerûn (and can sometimes call in favors of potions or even a clerical ally). When he expects to stay in a city for a while, he rents an unfurnished home or small warehouse for himself and his team, but otherwise lives on the road in tents. Khemed is of average height but very broad, sporting large tattoos of fire and symbols of Talos on his arms and chest. He enjoys using his spiked chain to disarm foes and employ attacks of opportunity against them when they try to reclaim their weapons. Against a superior foe, he fights defensively and has his employees set up flanking and give him opportunity attacks. Khemed is likely to be encountered working as a mercenary, protecting people of interest or valuable shipments, regardless of the nature of their employer or goods. If not employed, his team might be acting as bandits on roads or outside of known dungeons.